Over four decades I’ve listened to a lot of Supreme Court arguments, and seldom does an argument cause me to laugh out loud. But on Tuesday morning the court, with new Justice Brett Kavanaugh actively participating from the far-right end of the bench, heard argument in two cases arising under the federal Armed Career Criminal Act. The two arguments are best considered together, because the justices’ frustration with the statute appeared to build over time. In the second hour, as Assistant Solicitor General Erica Ross bravely stated the government’s views, Justice Samuel Alito interposed, “Yeah, I mean, you’re not exactly on a winning streak here in ACCA cases.” I couldn’t help but laugh. Talk about understatement. Last week I wrote previews of the two ACCA cases argued today, the first involving the definition of “robbery,” and the second the definition of “burglary.” After wanly noting the government’s non-winning streak, Alito went on to explain, more seriously, that “a majority of the Court really hates ACCA and is picking it apart bit by bit by bit.” He suggested that “we have made one royal mess” of interpreting the ACCA and “maybe we ought to go back and correct” it. Later in the argument Justices Neil Gorsuch and Elena Kagan both made similar suggestions, and Kagan noted that there is a bill “in Congress right now that” would revise the ACCA. Longtime Supreme Court advocate Jeffrey Fisher, arguing for criminal defendants Victor Stitts and Jason Sims, ended the second hour by seeking to turn this point to his advantage, suggesting that the court should rule for his clients so that, if Congress is dissatisfied, it will act rather than leave the court to “own this jurisprudence [for] a lot longer.” Predicting results based on argument is an uncertain venture at best, especially with a new justice whose views on the court’s ACCA jurisprudence are unknown. But the justices’ frustrations with the ACCA, both general and in specific applications, suggest to me another loss for the government in the second case, and possibly two before the ACCA dust settles. The ACCA, as written by Congress in 1984 and amended in 1986, imposes a mandatory minimum 15-year prison sentence on any federal firearms offender who previously has been convicted of three “violent” felonies. 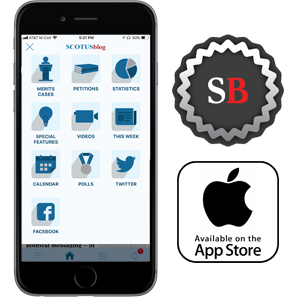 The Supreme Court has since determined that for felonies specifically mentioned in the statute, like “burglary,” federal judges must apply a “generic” definition of the crime for which the Supreme Court is the ultimate definer. For felonies not specifically mentioned, like “robbery,” the court must decide whether a particular state’s felony law meets the ACCA’s general definition of “violent felony”: any crime with a possible sentence of more than a year “that has as an element the use, attempted use, or threatened use of physical force against the person.” In 1990, in Taylor v. United States, the court ruled that the statutory word “element” means that a “categorical” approach must be used: Is the offense, as defined and applied in a specific state’s law, always defined to require the “use of physical force”? If not, a prior conviction for it does not count, regardless of the actual facts of a particular defendant’s case. In an offhand moment invoking some controversial lower court instances, Chief Justice John Roberts noted that “I actually tried that. … I held onto a dollar bill and asked each of my law clerks to try to pull it out of my hand. … It requires a lot of force.” But Assistant Federal Public Defender Brenda Bryn held her own, immediately reciting adjectives used in Curtis Johnson: “severe force, extreme, furious, vehement, strong, and powerful.” Alito asked whether “pinching” should count, and Justice Sonia Sotomayor noted that Curtis Johnson had said (with regard to the crime of battery) that a “tap on the shoulder” should not. Importantly, the court’s ruling here will govern robbery statutes in many other states, and Bryn and Assistant Solicitor General Frederick Liu starkly disagreed as to how many other states’ statutes would be “knocked out” of counting under the ACCA if Florida’s does not count. 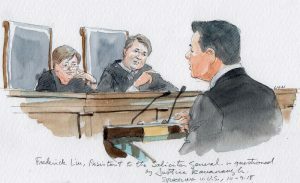 Bryn said four and Liu said “over 40.” (Gorsuch later referred to this as a “numbers game” that is often disputed under the ACCA.) Bryn also gamely noted that in one Michigan case, “spitting” apparently counted as sufficient force. Toward the end of this first hour, Justice Ruth Bader Ginsburg succinctly stated the key question: “[W]hat do you do with the express statement in Curtis Johnson that the word ‘violent’ in [the ACCA] connotes a substantial degree of force?” Sotomayor then concluded that “I’m saying little force is not substantial force, period, end of story.” Whether a majority of justices will agree is difficult to predict, but it does not seem unlikely. The difficulty with that conclusion seems to be that most states’ robbery convictions would then not count as predicate felonies under the ACCA. 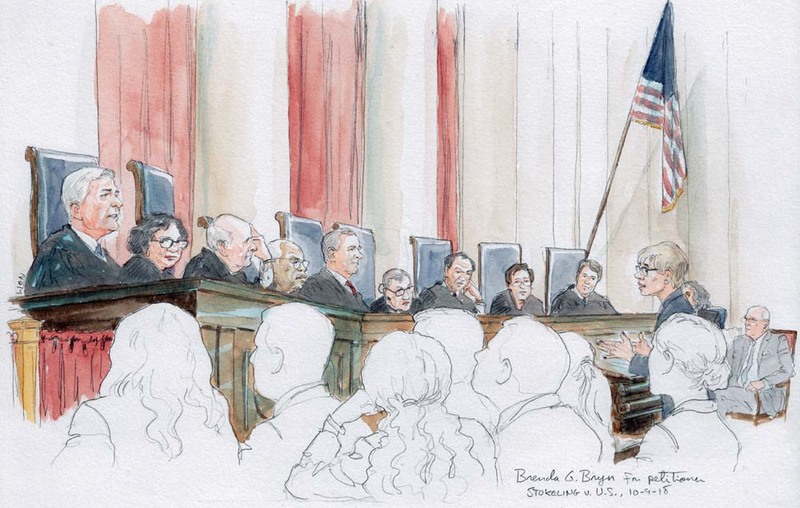 But as some justices appeared to suggest in the second hour, perhaps that is a problem for Congress to address, and as Gorsuch suggested, it seems unlikely that the court will “revisit Curtis Johnson” now. Are the justices seeking alliances? 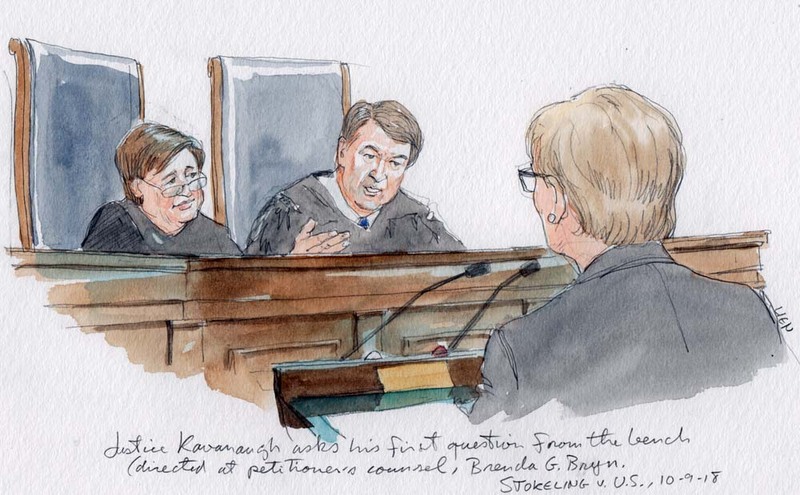 Although cold transcripts do not convey all meaning, I noticed a number of points in the two hours of argument today when the justices appeared to be actively seeking out alliances with each other, embracing each other’s remarks rather than contesting them. Kavanaugh now sits next to Kagan, and more than once he agreed with her by name. There were similar instances of agreement among Gorsuch, Kagan and Breyer. 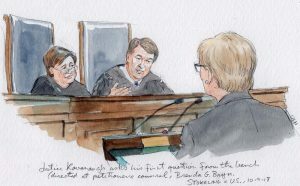 At one awkward moment, Alito appeared to mock some “hypotheticals that members of the Court and their law clerks can think of,” referring almost explicitly to Sotomayor. But for the most part the justices seemed to be working hard to find common ground. The second hour involved two consolidated cases, one from Tennessee and the other from Arkansas. The defendants had both won below, and they apparently made the wise decision to grant the full half hour of their argument time to Fisher. Unlike Stokeling, this case involves a crime specifically listed as a “violent felony” in the ACCA: “burglary.” The case asks what “generic” definition of burglary the court should adopt for the ACCA, when Congress failed to define the term in the statute. More precisely, are any type of “vehicle” burglaries included, and if so, where and how should a line be drawn between vehicles used for “overnight accommodation” versus cars in which a person might occasionally sleep? Ross quickly began by conceding for the government that the “occasional use for sleeping” vehicle ought not to be included, but argued that (as some state statutes say) a vehicle “designed or adapted” for overnight sleeping should count. She suggested that any car used by a homeless person for regular sleeping would show “adaptations,” but Fisher called that assertion “empirically untrue” and offered some research to support this point. Ross steadfastly maintained that “edge cases, hard cases,” ought not to drive the analysis, and that the line could be drawn at vehicles regularly used for overnight sleeping – otherwise the burglary laws of a majority of states will not count for ACCA enhanced sentencing. But Ginsburg then added a sixth idea: “[B]ecause this is such a harsh statute,” why not employ a “clear statement rule for Congress”? That is, hold that any conduct not clearly encompassed by the statute is not included. Fisher embraced this idea, urging application of the “rule of lenity,” which requires an ambiguous criminal statute to be interpreted in favor of the defendant. 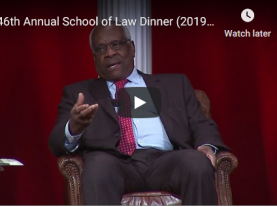 Toward the end of his half hour, Fisher was allowed to speak without much interruption, often an indication that the justices are largely satisfied. Alito continued to push, and Kavanaugh asked a question about the details of Taylor that showed his quick immersion in the briefs for this case. Gorsuch ultimately suggested that perhaps the court should “just remand … and … let the lower courts figure it out.” This does not bode well for a government victory in the case. In the end, Fisher’s argument that the “safer path” would be for the court to “continue [with] its prior precedent,” and let Congress address any perceived failures of the ACCA to sweep in various state-law crimes, may win the day. Taylor can easily be construed to encompass the defense positions in both Stokeling and Stitt. On the other hand, if a majority is determined to apply the ACCA in a broad and severe way, an opposite result is also plausible. We will have to wait (likely until at least December) to see whether a spirit of collegiality, combined with shared frustration with a 32-year-old statute that has spawned many unanticipated difficulties, will lead to further ACCA-application losses.